Is the printer connected to the computer? Can a test page be printed from Windows? Open the Control Panel to the Printers and Faxes option looking for the icon as shown as Figure 1. Right click on the name of the printer connected to the computer from the list and select properties. The properties display will open as shown in Figure 2. 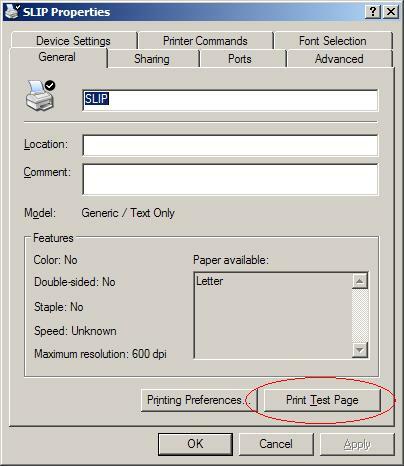 Select the Print Test Page button to send a test page to the printer. If the test page prints then your printer is ready for further configuration in System Five. If not then contact your IT Professional to assist with further troubleshooting. Figure 2 - Print Test Page from the printer properties window.